Recently the BBC presented a feature on the Petite Ceinture (“Little Belt”), a historical and defunct railway route skirting the outer edge of central Paris. 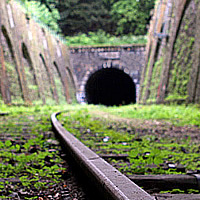 The feature appeared on its News Magazine Web site and was titled “The wild abandoned railway in the centre of Paris” and included a fascinating short video. In the video BBC journalist Neil Meads accompanied Paris photographer Thomas Jorion, who specialises in portraying decaying buildings, infrastructures and environments that have fallen out of use. His highly atmospheric photographic approach is to reflect on the “temporality” of artefacts. He has researched and documented the line since 1996 and has referred to it as “the last great wasteland” in Paris. 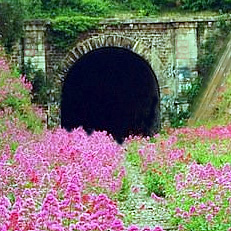 The Petite Ceinture largely maintains a path parallel with the Paris Périphérique (inner ring road) and is mainly separated from street level, i.e. it passes above and below the streets of the city. 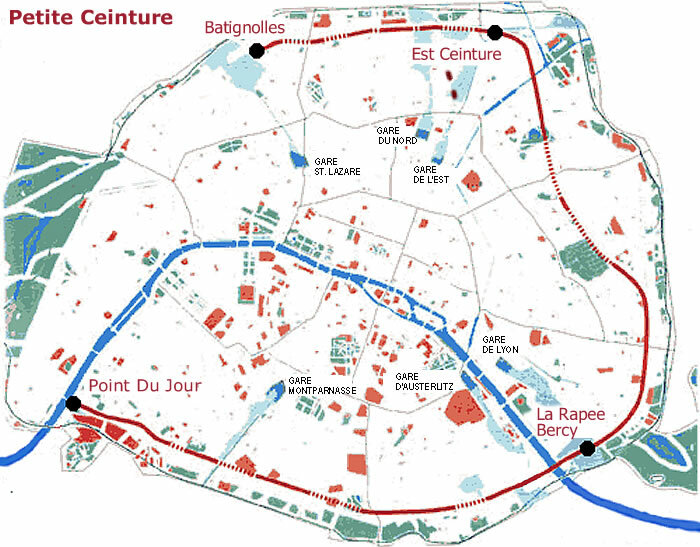 At one time it completely encircled inner Paris but the course of the railway now only survives from Batignolles, via Est Ceinture and La Rapée Bercy, to Point du Jour – effectively covering three quarters of the original route. Almost 50 years before the Paris Metro started, the [steam] trains of Petite Ceinture provided a convenient railway system, by transporting passengers within the fortified walls of the city along a 20 miles (32 km) route. The Petite Ceinture originally had 29 stations and also provided a means to connect the six major Paris railway termini (Gare Saint-Lazare, Gare du Nord, Gare De L’est, Gare de Lyon, Gare D’Austerlitz and Gare Montparnasse). It started the first passenger service in 1852 and continued operating until 1934, when it was abandoned. The line had been in gradual decline in the early 1930s, following the 1920/30s expansions of the Paris underground Metro system. Along the remaining 14 miles (23 km) of the route, the tracks of Petite Ceinture are largely inconspicuous and unseen against the backcloth of the busy Paris environment. Cuttings, bridges, extensive tunnels, and even the railway tracks, remain remarkably untouched and are virtually hidden away from the neighbourhood streets. Flora and fauna have slowly regained possession in the spaces, which provide a safe haven for animals and the spread of a variety of wild flowers. 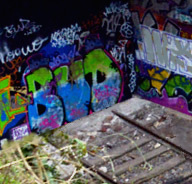 The route is also adorned with colourful graffiti and street art. Of the original 29 stations, 17 now remain and there are 10 tunnels. In 2008, a part of the line between Porte d’Auteuil and Gare de la Muette was opened for pedestrians to use as a nature trail, although the remainder was officially off limits to the public. In reality many people still explore these other parts – not surprising, given that a tunnel on the abandoned line apparently has a small entrance to the Paris Catacombs, in one of its walls! Enthusiasts describe the railway as a quiet, natural garden space within Paris. 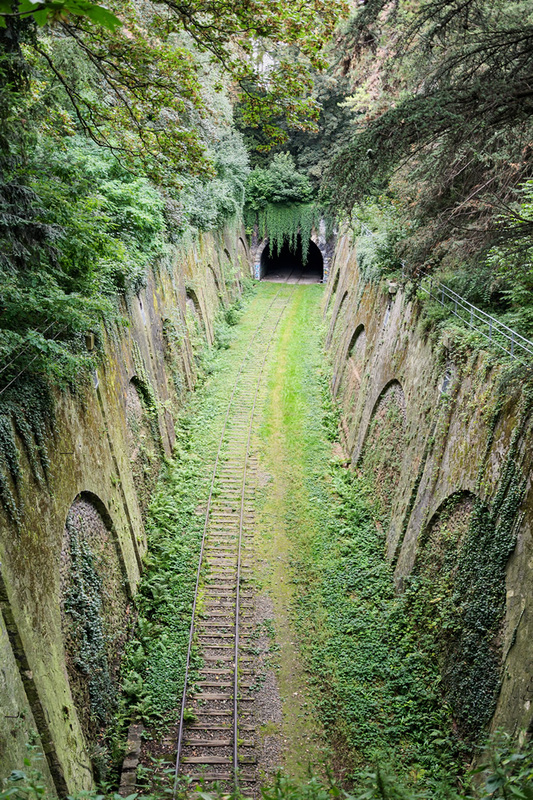 The future of the undeveloped and decaying infrastructure has more recently been the subject of much debate and argument, as people rightly regard the Petite Ceinture as part of France’s national heritage – a relic of a bygone railway era. There have been plans to refurbish stations, to be used as shops, cafes or bars, and there are groups who simply want to protect the abandoned railway and stations and have the route dedicated for pedestrian use – three sections have been identified as green walks. The Paris Tourist Office provides some information about the railway. Equally, some useful current background to recent developments can be found in blogs, e.g. La Petite Ceinture and Walks around Paris, which also provides additional links about the railway (tip: click on any seemingly dead picture links to view the image gallery). Also, try this link for archive images of the stations and route map. For pictorial views I checked out the photographer Thomas Jorion and also found Anthony Hamboussi. Also, try searching other blogs/features, e.g. petiteceinture.org, Atlas Obscura, Paris, or Rue89. The Open Street Map provides excellent and interesting geographical data of locations along the route.